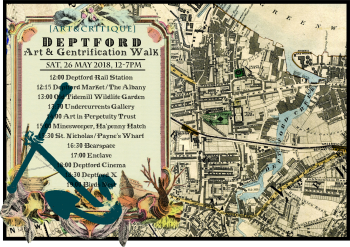 In May [ART&CRITIQUE], a London-based alternative art education network, is visiting Deptford for a day of discussions on art and gentrification. 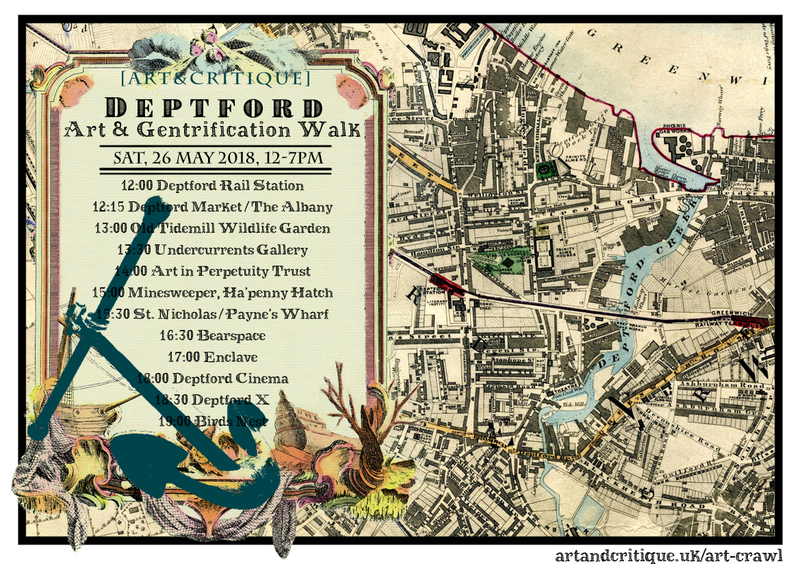 Join them for a tour of galleries, studios, community spaces and landmarks on a walk along the streets, waterways, green spaces and new developments. They will meet artists, curators and activists to explore how they are resisting or overcoming the displacement of communities and the shrinking of public and creative spaces. 15:30 Heading north towards the river we will visit remains of the 16th century Royal Dockyard, passing by the church of St. Nicholas, the site of the former Deptford Power Station, Payne’s Wharf, Master Shipwright’s Place, Twinkle Park and the Dog & Bell.